Another year older means an excuse for an extended birtday roadtrip in the desert. It has become something of an annual rite as I gather up fellow some friends to tackle desert obscurities and enjoy some wilderness revelry. Most wouldn't be joining me until the weekend and today I was on my own - this generally means peaks accessible from pavement or good dirt roads. I picked a P900 in the Bullion Mtns on the northeastern edge of the 29 Palms Marine Base north of Joshua Tree. With a handful of other summits to include as bonus peaks, it made for a cross-country jaunt covering some 12mi and more than 4,000ft of gain, and with it most of the available daylight. I managed to drive a few miles on the decent American Mine Rd, a dirt road off paved Amboy Road south of the small waystop of Amboy on old Route 66. I stopped where the road to the America Mine is no longer useable by low-clearance vehicles, parked off to the side and set out around 8a. I first made my way south to the America Mine, an abandoned gold mine with exceptionally low-grade ore that never amounted to much. Acres of land are taken up by neat piles of tailings with a few decrepid trailers that probably served as offices back in the day. From the mine I headed WSW to Peak 1,838ft, cross-country over easy terrain for more than a mile, crossing into the military base along the way. At the base of this small standalone peak are the remains of an old prospect. A mine shaft cuts into the mountain though not very deeply, some neat rock walls and a rusting stove are all that remains from an old homestead built here. 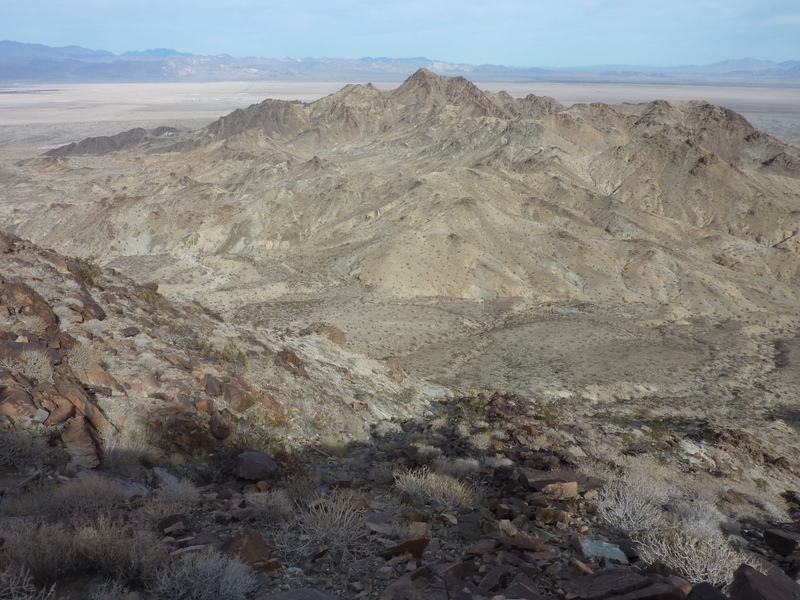 Climbing about 600ft to the summit, I found a large rock cairn with views sweeping west and north across desert plains. A large military exercise was taking place about 4mi to the southwest in an open stretch of desert within the Bullion Mtns. I had heard blasts going off regularly starting around 9a but it wasn't until I was atop Peak 1,838ft that I knew where the reverberating concussions were coming from. A small town was being bombarded by mortar rounds with armored vehicles approaching from the north. It was too far away to see individuals, but the dust and smoke from the live fire and moving vehicles was easy to discern. I figured as long as the exercise stayed close to the town I'd be safe, but I kept a wary eye out nonetheless over all the terrain I traveled. I dropped off the south side of Peak 1,838ft and headed in that same direction for Buff BM, about 2.5mi distant. The route was very straightforward, following the broad wash area south to where it narrowed, then jumping on a N-S subsidiary ridgeline leading up to the main crest. Buff BM is then found about 1/3mi west along the crest. The high perch afforded the closest view of the exercise still going on below to the west. The armored vehicles were now partially surrounding the town and it looked like the firing had ceased for the day. A debrief session perhaps? Despite the distance (still more than 3mi), I was cautious about my exposed position at the summit. I stayed only a few moments to check for a register (none found) before slinking back down the east side to get out of view. It was 11a when I reached the summit, having taken about 3hrs from the start. The return would be even longer because I took a more convoluted route, returning along the crest and the connecting ridgelines leading up and over the other two bonus peaks. The ground, primarily broken volcanic rock, was more difficult than the ascent route and required more caution. At one point I came across a small area of rock that looked to have been more recently disturbed, perhaps by a rockfall. I looked around for such natural causes before the more obvious reason became apparent - the tail fin of an exploded mortar round was found among the shattered rock. It seems that it would be wise to keep an extra eye on the ground in case some unexploded versions were still lying about elsewhere. The ridgeline leading up to East Buff BM is a bit more convoluted than I was feeling up for, so I dropped into a wash on the west side to avoid some of it and shortening the effort a tad. It was after 1:30p when I reached the top of East Buff BM. Though I found no benchmark (nor had I found one on Buff BM), I found one of the reference marks labeled as "BULL". I wondered if the maps weren't in error in calling these Buff and East Buff BM. "Bull", short for "Bullion", would make more sense. To the west and northwest could be seen small dust clouds as the vehicles from the exercise returned north along the lonely stretch of dirt road leading into the area. I spent another 45min traveling between East Buff BM and Peak 1,424ft, the last significant summit found on this subsidiary ridge extending northeast from the main crest. From its unexceptional summit, I dropped northwest down a ridge in line with where I'd parked, bypassing the America Mine for the return. There were a few more interesting sights before I got back, including the rusting remains of what must have been an expensive piping project and a mining claim marker with the 1988 claim record still intact, nicely folded and placed in a small film cannister.